Antibodies are proteins created by the immune system to identify and neutralize invaders, such as bacteria and viruses. Each antibody recognizes a specific kind of target. Monoclonal antibodies are antibodies that are identical to each other because they were produced by clones of one parent immune cell. Monoclonal antibodies are used extensively for research purposes as well as to diagnose and even treat disease. Production of monoclonal antibodies involves the use of animals, mostly mice, in stages. First, a small number of animals are injected with the substance against which antibodies are desired. (The use of animals even at this stage is unnecessary, because sophisticated genetic engineering techniques can bioengineer antibody-producing cells.) Then the animals are killed and the antibody-producing cells are isolated from their spleens. This is followed by a test-tube stage where these antibody-producing cells are fused with fast-growing cancer cells. The resulting combination is called a called a "hybridoma." At this stage, researchers have two options. The first, the ascites method, involves the harmful and painful use of mice: the hybridomas are injected into their abdomen, where these malignant cells multiply and produce antibody-rich tumors. The abdominal fluid, rich in antibodies, is drawn with a syringe several times, until the animal dies. With the alternative approach, the hybridomas are grown in culture rather than in live mice, and the antibodies are isolated and purified from the culture fluids. Tissue culture methods to produce monoclonal antibodies are highly developed. In Switzerland and the Netherlands, use of the ascites method is banned by law, and it can be authorized only in exceptional cases. In the UK, the government declared a phase-out of the ascites method. In 2002, the most recent year for which statistics are available, no mice were used in the UK for antibodies production with the ascites method. Even in the U.S., the National Institutes of Health (NIH) encourages researchers to use the tissue culture method routinely, and to use the ascites method only in exceptional cases. And yet in Israel, there is no restriction on the use of the ascites method. From partial data contained in protocols of the Israeli National Council for Animal Experiments, released by Court order, it appears that thousands or even tens of thousands of mice are used each year to produce monoclonal antibodies through the ascites method. Update: In 2009, Japanese researchers reported the development of a method of producing monoclonal antibodies from human blood, without the use of animals. Genetic engineering is the alteration of the structure of the genetic material of a living organism. Researchers and drug companies are attempting to genetically engineer farm animals, so that pharmaceuticals can be harvested from their milk and eggs. A researcher from the Volcani Institute of Agriculture in Israel bioengineered goats, in an attempt to establish a commercial herd that would produce the protein albumin in the goats' milk. The use of animals in "pharming" — as bioreactors, living factories, to produce pharmaceuticals — is unnecessary, as non-animal alternatives exist. Virtually all proteins used for therapeutic purposes can be produced in genetically engineered bacteria, yeast, or mammalian cell cultures. For example, albumin was successfully produced in genetically engineered yeast. Common protein drugs, such as insulin, are produced in bioengineered bacteria, while clotting factors used to treat hemophilia patients are produced in genetically engineered mammalian cell cultures. Such in vitro methods offer a more standardized alternative to live animals in the production of valuable pharmaceuticals. Many millions of women worldwide take hormone replacement therapy (HRT). The leading preparation, Premarin, produced by the American company Wyeth-Ayerst, is among the most widely prescribed drugs in North America. 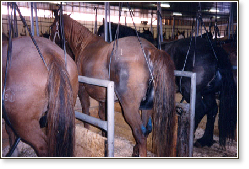 As its name suggests, Premarin (pregnant mare's urine) is produced in horses, tens of thousands of them. The hormone itself is isolated from the mares' urine, and to ensure a high concentration of the active compound in the urine, the mares are repeatedly inseminated to make sure they become pregnant as soon as possible. The foals usually end up in slaughterhouses, and the mares live in confined conditions that severely compromise their welfare. Premarin is only one of several brands of HRT available in Israel (where it is sold under the name Premaril) and elsewhere. Other drug companies, like Novo Nordisk, produce HRT without the use of animals. If you are taking HRT or an estrogen replacement, please ask your doctor to prescribe brands that are manufactured without the use of horses.